Last week we saw the release of Sallys Spa on the Windows Phone Marketplace, but little did we know that a week-long app update/download issue would follow. If you noticed, last week there was apparently no Deal of the Week, and we will assume that is due to the recent Windows Phone Marketplace issue preventing about 100,000 applications from downloading/updating. To name a few of the most popular applications experiencing this issue are WhatsApp, Bing Translator, and New York Times. What exactly is going on? Read the explanation below from the Windows Phone Blog. We’ve run into an issue with the digital certificates used to sign apps, and this is preventing some phones from installing some apps published during the last couple of days. We’ve investigated and determined the issue only affects phones that upgraded to Windows Phone 7.5 from an earlier version of the operating system. It does not appear to impact phones sold with Windows Phone 7.5 preinstalled. We estimate the issue also affects only a small percentage of the 100,000-plus apps in Marketplace. Among the more popular ones affected are the New York Times, WhatsApp, and Translator from Bing—all of which recently issued new updates. There’s nothing wrong with your phone and everything else should work fine. Microsoft has also identified a fix for the issue, they are just testing it a bit before pushing it to the Marketplace. Do not uninstall any applications, as you will also lose any saved data for it. Also, be patient, if you haven’t been able to update your applications, or download new ones, it is not your phone nor your internet connection. 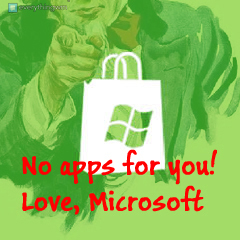 Microsoft has temporarily halted all application publishing to the Marketplace until the issue is fixed. With this issue at hand, we will update you as soon as it is all fixed. In the meantime, we don’t expect any new app releases anytime soon, or any Deal of the Week this week either.